University goes back today, school has been back for a few weeks and I’m sure most of you have been back at work for at least the last month. For me, this means long days at uni filled with chemistry labs and the need something delicious and energising to keep me sustained. 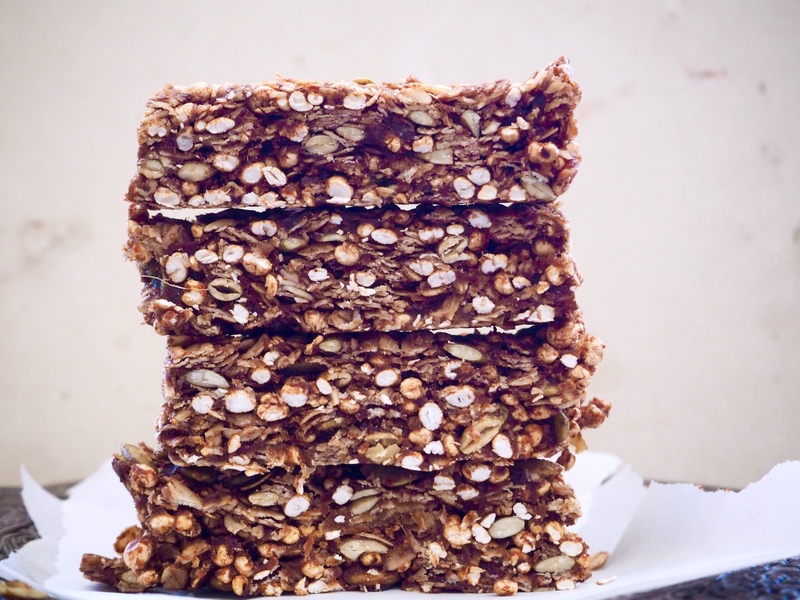 I have previously posted the recipe for my Nutty fruit cake, which is a great snack while you’re on the run and is often found in hanging around the bottom of my bag. 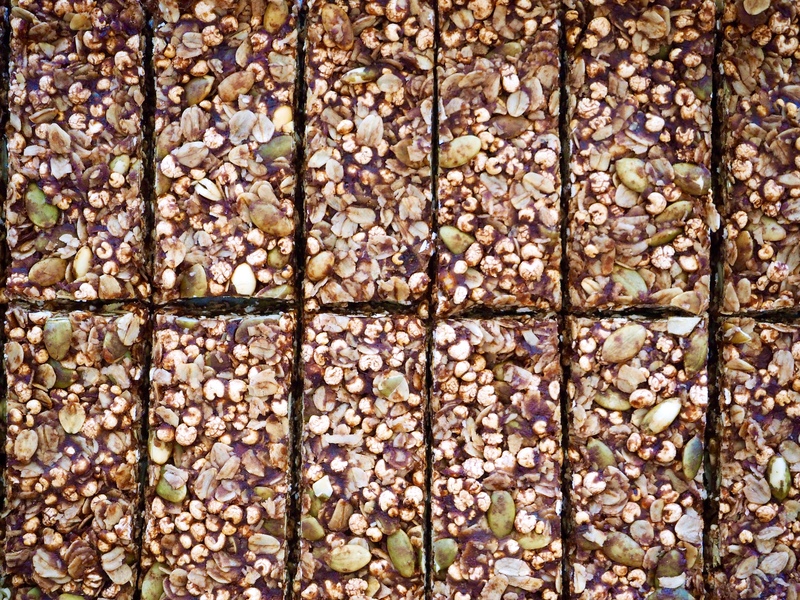 These bars are another delicious snack and with the addition of cacao which is full of antioxidants, magnesium and iron they really will give you a boost. 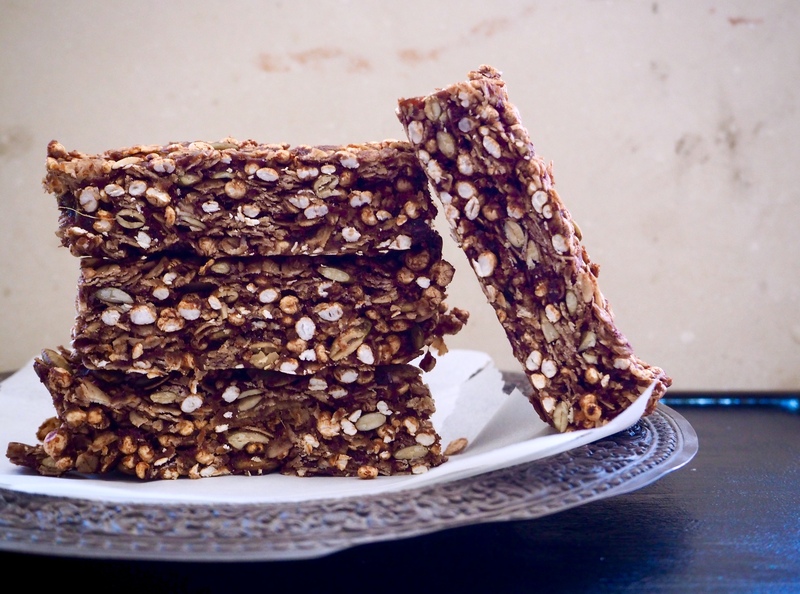 I must admit though that these energy bars don’t travel nearly as well as the indestructible Nutty fruit cake however they are just as delicious enjoyed at home with a big cup of tea or a glass of fresh nut milk. Filled with the rich taste of cacao and spicy ginger these are the big kid addition of a chocolate bar so if you want to make them for some little people reduce the ginger and perhaps addd a little honey for a sweeter version. Preheat your oven to 180 degrees celsius. Place the rolled oats and pumpkin seeds on a baking tray and pop it into the oven for 10-15 minutes or until the oats are just golden and smelling delicious. Meanwhile, line a 20x30cm lamington tin with baking paper and set aside. Drain the dates, place in a small bowl and mash with a fork into a sticky smooth paste. Add in the tahini, coconut oil and ginger, mixing to combine. In a large bowl mix the puffed quinoa, cacao powder and sea salt. Add in the toasted oats and pumpkin seeds. Finally spoon over the date/tahini mixture and mix quickly to combine. Spread the mixture evenly into the prepared tin and press down firmly with your palm. You may want to wet your hands very slightly to stop the mixture sticking to you! Place in the fridge to set for about 4 hours before slicing into bars.